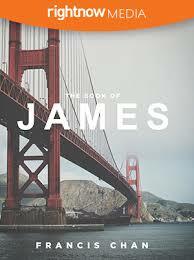 Well we recently wrapped up our Christian study with Andy Stanley and are moving on to the Book of James. But I wanted to take a moment to tell you all how much our group loved Christian! It is hands-down THE best study that we’ve done in our couple’s small group. Even the men were fully-engaged in the discussions and many of the lessons were shared by us on social media platforms like Facebook. The information was just too good not to share with family and friends. If you are looking for a study for your small group, I highly recommend Christian…it would work for new thru spiritually mature believers. And now we kick-off our Book of James study with Francis Chan. We haven’t really done a specific book of the Bible study in our group up to this point so we are looking forward to digging in. The Book of James is literally my favorite book of the bible so I’m super excited to get started. Francis Chan is usually pretty good and he doesn’t pull any punches when it comes to teaching what God expects of us. Here’s a preview of what we are expecting to see and hear…. Please note that this study is only available through Right Now Media so if your church or group leader doesn’t have a login to this site, you won’t be able to do this study.